Dogs have the capacity to feel envy just as humans do. We don’t need proof of this and dogs don’t need to speak in a human tongue to convey this emotion to us. They are naturally social animals as humans are. Social animals tend to feel jealousy which is a sense that everyone is not getting a fair share of just treatment. Whether jealousy is a reasonable and logical reaction is not the question – the sense of being treated unfairly is subject to the perception of the one feeling the emotion. How Do Dogs Show Jealousy? Surely you try to bestow equal love and affection to each of your dogs, should you have more than one. However, what is perceived by the dogs can be a different story. If one dog feels he is missing out on an equal share of attention or affection for too long, you may notice he will be anxious and irritable. He may even lash out at the dog who he perceives to be receiving more attention. Giving out treats is one of the main methods that people use to influence and manipulate dogs’ behavior. It would be unimaginable in a multi-dog household to exclude one dog from receiving treats. Yet, if this were to happen, the neglected dog will show jealousy by refusing to cooperate or to maintain the behavior that you are trying to impress upon him. Dogs who just gave birth will show affection and protection for their pups but the feeling wears off soon after they finish nursing. One of the pitfalls of having puppies in the household is that the little ones often are cuddled and cooed over more than the mother. Take care to not let this happen – the mother dog no longer will feel the same attachment to her offspring and may become aggressive if she feels she is not being given the proper respect. 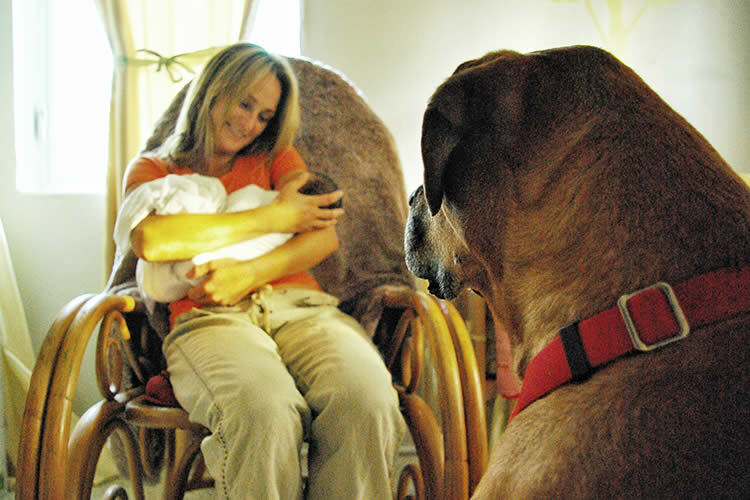 Fortunately for us, dogs do not suffer the complexities of human jealousy. For example, if you gave one dog a piece of beef and the other dog a piece of chicken, they wouldn’t feel slighted about not receiving the same treat. They would both be happy with receiving a treat no matter the type. With humans, not only is being rewarded important but the type of reward and the merit system implemented is also just as important. Make sure you are doling out equal love, attention, and treats to all dogs in your household. If you have a puppy or a special-needs dog, don’t let them commandeer your time. Your dogs with seniority deserve the same if not more of the share of your affection and the other dogs will not suffer more for it. Quite the contrary – if the dogs are assured of your fondness, they won’t squabble between themselves and they won’t act out against you in devious little ways (such as urinating on your clothes or bed). Even if you feel you’re being equitable, always look at the behavior of your dogs for an indication of how they are perceiving you. If you notice one dog is especially stressed out when you’re petting another dog, take steps to alleviate the situation. Be aware that bestowing more affection on the “neglected” pet is not always the answer – a dog might be used to a certain lifestyle and if you change the dynamics, this can be particularly aggravating to them. You don’t always want to give into their demands; you should be the one in control. Discovering the reason behind your dog’s jealous behavior is the key to remedying the situation. AKC.org: Do Dogs Feel Jealousy or Envy? Why Does My Dog Nibble Me?